Welcome to our free Google Analytics tutorial. This tutorial is based on Webucator's Introduction to Google Analytics Training course. In this lesson, you will learn about all of the various reports in Google Analytics. By the end, you will be able to analyze and interpret many different reports. How to navigate the reports interface. How to use and customize the dashboard. How to export data from reports. Various methods to slice and dice your data. Analyzing and interpreting default reports. 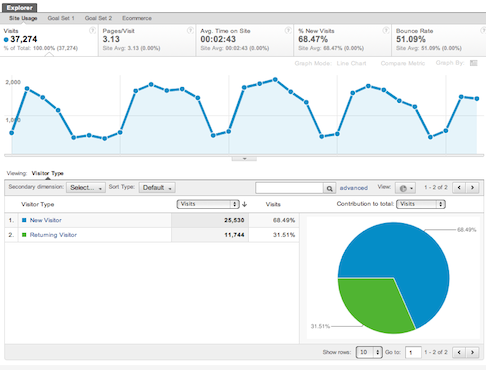 Reports in Google Analytics convert raw data into presentable information. In addition, links and options within reports provide interactive segmentation which enables you to reorganize the data on the fly. There are two fundamental building blocks to any report in Google Analytics: metrics and dimensions. Metrics will always be expressed in the form of a number. Metrics are standalone entities. When you look at a metric in a standalone fashion it provides you with information about the site-wide performance. Metrics will form the columns of a report structure in Google Analytics. 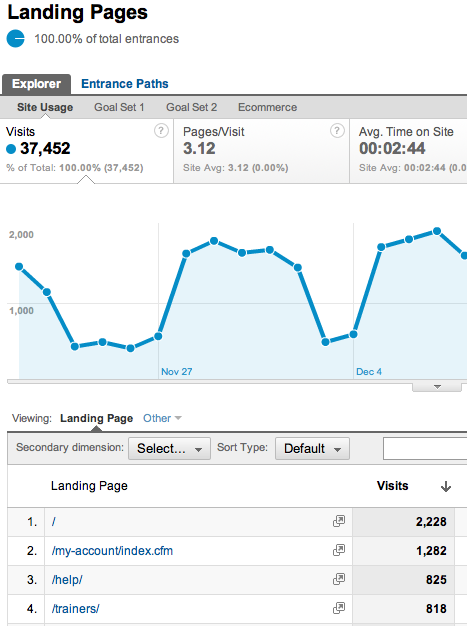 Some of the common metrics you will find in Google Analytics are visits, pageviews, bounce rate, etc. Dimensions are non-numerical data fields. Unlike metrics, dimensions are not standalone entities, i.e., dimensions are not generally meaningful when viewed individually. Dimensions, when coupled with metrics, provide meaningful context to the data. Dimensions can be used to segment a metric. 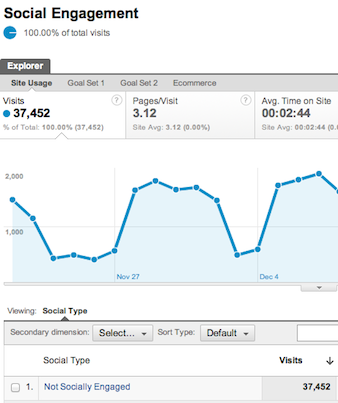 Google Analytics provides five main report categories. The following table provides an overview of the available reports along with their definitions and significance. Audience This category provides information about your visitors such as location and language. Also allows you to drill down and view the characteristics of different visitor segments and examine the different factors that make up visit quality. Advertising If you are using Adwords reporting, the reports in this category help you analyze the effectiveness of your AdWords campaigns. Traffic Sources Reports in this category provide an overview of the different kinds of sources that send traffic to your site including natural (organic) and paid sources. Content These reports provide information about your content including an overview of pageview volume and lists the pages viewed. Conversions Reports in this category provide information about conversion rates and goal paths. (Important for non e-commerce sites). For e-commerce sites, this category also provides commerce tracking such as revenue generated and revenue sources (only available when enabled). The dashboard module, as seen in the screenshot below, allows users to create ways to look at their data in a quick, concise way. 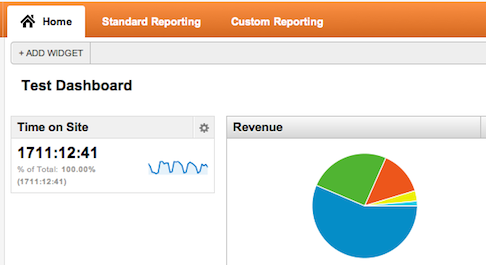 Please note that in the previous version of Google Analytics, the dashboard was the "homescreen" for your reports. Now, it's separate from the reporting tab, and is found under the Home tab. The dashboard is where you get to review the most relevant summary information about your site that you want to see at a glance. The dashboard is completely customizable. You get to choose your desired widgets to add to your dashboard. You get to develop multiple dashboards, and then share with others, as needed. You also have the ability to show any relevant widgets right within your custom dashboard. Again, this is a great opportunity to have the most relevant analytics information available at a quick glance. To customize, you first need to choose + New Dashboard. And to get rid of any of your widgets within a dashboard, simply click the gear button on the top right of the widget. You will then be brought to the settings screen and you can delete from there. Develop a possible customized dashboard for your IT department. Suggested dashboards for your IT team. Take a look at the following screen shot. It shows a customized dashboard created for your team. The widgets in the screen shot are customized. The dashboard provides important information for your IT team without requiring in-depth use of Google Analytics. The following example illustrates the common structure of all the reports found in Google Analytics. These elements are found on a majority of the reports on the Standard Reporting tab. We will discuss each these elements in detail during our training session. Data exports are available at this time in some of the industry standard formats (CSV, CSV for Excel, and TSV). Navigate to the desired report using the report navigation panel. Click on the Export tab located in the upper left hand corner. Select the format in which you wish to export the report (e.g., TSV). Once you click on the particular format type, Google Analytics will immediately download a file to your computer. First you will need to select the Email tab, which is to the right of the Export tab. In addition to providing the details discussed earlier, you will need to use the drop down menu to select the frequency at which you want to send your emails out. You can also select the Include date comparison option which will allow Google Analytics to compare the current results with the previous week or month based on the date range that you have selected. Click the Schedule button to complete the process. It is important that you dig deeper into reports by slicing and dicing the data available in the default reports. Looking at a single metric is seldom helpful in deriving reliable business intelligence. When you want to identify particular trends/patterns in your data. When you want to identify effects of business cycles on your website traffic. When you want to do before and after analysis (e.g., what happened after running an online promotion). For comparing historical data, first enable the Compare to Past option and then provide a set of valid date ranges. To begin, choose a 'Web Property' and associated Profile from the Accounts List menu, and then click on any desired report. Then click the Compare Metric link (top right of graph display) and select the secondary metric you'd like to compare. This method is helpful with respect to determining if two metrics share any sort of cause-&-effect relationship. For example, see the screenshot below where we're looking to compare Visits with Unique Visitors. You can cross-segment your data within a default report by using different sub-dimensions. The following example illustrates how to use the cross-segmentation option to see the classification of U.S. visitors in reference to different mediums they used to reach your website. Select the Map Overlay report from the report navigation interface. 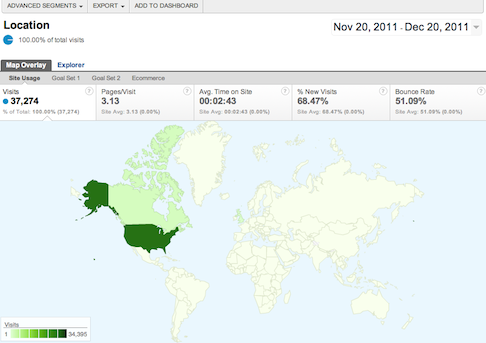 Within this report, under the Site Usage tab select United States as the country by clicking on it. Using the Secondary dimension drop down menu, select Medium as the dimension. 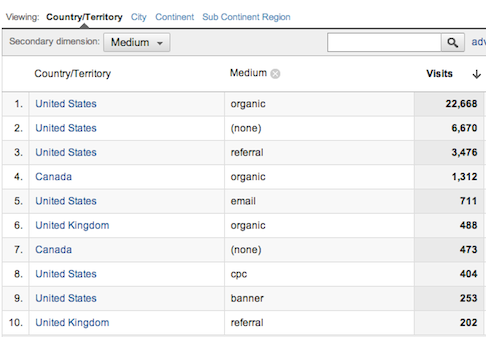 Google Analytics will cross-segment the map overlay data with the medium via which visitors came to your site. The report visualization control panel offers different options to slice and dice your data.The following example illustrates the use of pivot tables for segmenting your data. We are interested in knowing the amount of traffic each source is sending to your website. Also, we want to classify this traffic into New Visitors vs. Returning Visitors. Pivot tables will help in accomplishing this task. Navigate to the All Traffic Sources report using the report navigation panel. Using the report visualization control panel, select the View option. Using the drop down menu set the Pivot By field to Visitor Type. New vs. Returning Report, with sub-dimension Country: shows which countries are sending what type of visitors. Keywords Report, with sub-dimension as Source: shows a list of the top five organic keywords and the search engine associated with each keyword. Top Landing Pages Report, with sub-dimension as Keywords: shows the top five landing pages and the respective keywords that were responsible for bringing traffic to these web pages. Content by Title, with sub-dimension as Source: shows specific web pages (e.g., web pages related only to Cisco Training) and also shows which sources (e.g., Google, Bing, etc.) brought traffic to these web pages. 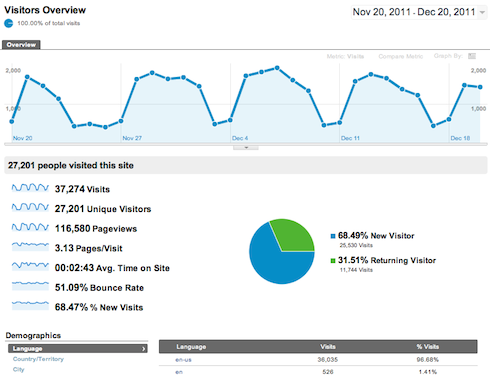 Analyze the effects of the holiday season(s) on remotecourse.com in terms of visits per day (for example, visits per day during Christmas vs. Thanksgiving break). Write down your observations and share this with the class. (Use the Webucator account for this exercise). Analyze activities on remotecourse.com during the current financial quarter as compared to the previous year in regards to overall traffic on the site. For example, compare activity between July 1, 2009 and September 30, 2009 to activity between July 1, 2008 and September 30, 2008. Write down your observations and inference. (Use the Webucator account for this exercise). 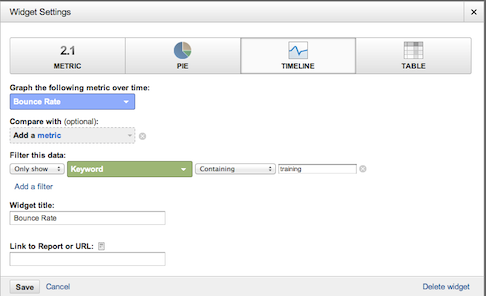 From the Analytics Setting Screen select the Webucator account. Select www.remotecourse.com as the profile to work on. Click on the Active Date Range drop down box. Select the 'compare to past' option. Using either the Calendar or Timeline tab, select the appropriate date range (i.e., 12/24/2008 to 12/31/2008 for Christmas and 11/24/2008 to 12/01/2008 for Thanksgiving break. Note: The number of days in each date range must be equal). Using either the Calendar or Timeline tab, select the date range indicated in question 2. Note: The number of days in each date range must be equal). The number of pageviews on your website is increasing. How would you determine if this increase in pageviews is associated with an increase in traffic (i.e., more people coming to your website) or is associated with an increase in engagement (i.e., the same amount of visitors started looking at more pages). First navigate to the Visitors Overview report using the report navigation panel. Use the drop down menu in the upper right hand corner and select the Compare Metricoption. Check the relation between Unique Visitors with Pageviewsby selecting appropriate radio buttons (refer to the below screen shot). Use the same method described above to check the relation between Pageviews and Pages/Visit by selecting the appropriate radio buttons. 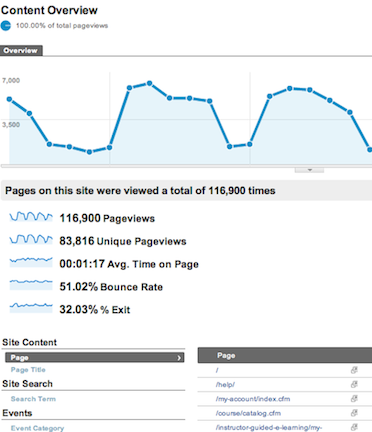 From the above screen shot we can say that pageviews in this example are driven by visitors and not by engagement. Overview Provides baseline information that is particularly helpful when viewed in the context of another time period. Demographics Helps you compare location, language, and any custom or user-defined variables. Behavior Helps in segmenting your visitor's behavior including new vs. returning metrics, frequency of visits, and their engagement with your site. Technology Helps quantify some IT-related metrics for your website. Social Helps looks at overall social media engagement between visitors and your website. Mobile Compares your overall traffic in regards to users accessing your site via mobile devices. In the following sections, we will explore applications of different reports available in this category. As the name suggests, this report provides an overview of the most important data available in the Visitors section of Google Analytics. This report has the following components as shown in the screen shot. 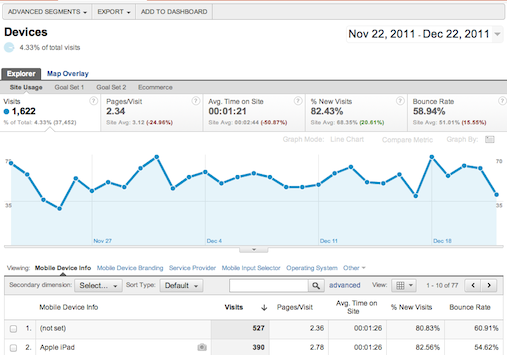 The left-hand side of metrics is derived from the Visitor Trending section. Each of the titles in this element is a link to a full report available in the Visitor Trending area which will be covered later in the manual. 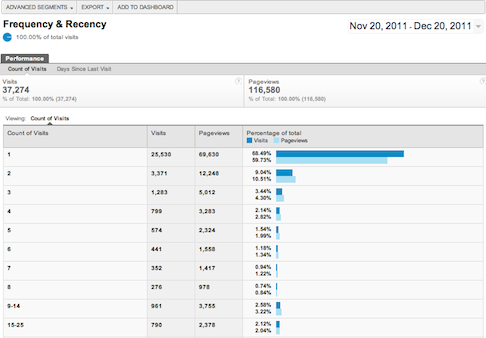 This section provides answers to questions such as how much traffic you received (visits), what was the engagement (Avg. Pageview, Time on Site and Bounce Rate) and how many new customers you were able to attract. 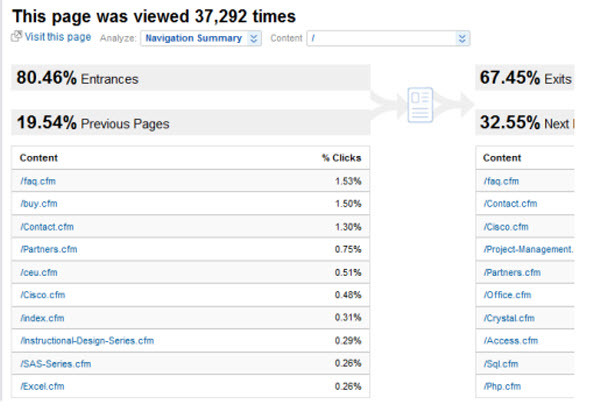 On the right-hand side, we see a quick breakdown of new vs. returning visitors on your site. And, at the bottom, you're able to click on any report on the left-hand side, and view the corresponding high-level results on the right. In the above screenshot, we were focused in on the Language report. Map overlay report is helpful in geo-targeting your online marketing campaigns. For example, using Google Analytics, we can determine which of the courses are popular in particular cities (e.g., our SAS series courses are more popular in California, etc). Based on this we might decide to heavily market SAS series courses in California. You can leverage the map overlay report in identifying the most lucrative geographic markets to possibly expand your business activities. To identify which what type of online visitors (e.g., new vs. returning, buyers vs. non-buyers) a particular region is sending to your website. This report shows the number of new and returning visitors to your site in the context of site usage, goal conversions and several other metrics. Use date range comparisons to identify if your marketing campaign is effective or not in acquiring new customers. This simple logic can be applied if you are running a retention oriented marketing campaign. When you have set up macro or micro goal conversion using Google Analytics (e.g., Newsletter Sign-up, Contact Us Form Submissions, Purchasing Products, Printing Coupon Code, etc). You can use this report to see whether new or returning customers are fulfilling these goals. This report shows the number of visits each visitor participated in during the time period you chose (frequency) and the number of days since a visitor's last visit to your website (recency). Use the Frequency report to determine if your site is successful. If you have a content site, and you want visitors to check out your site regularly, make sure these numbers match your goals. On the opposite side, if you are an e-commerce site, you can determing a potential customer's sales cycle; are they buying right away, or do they keep coming back to check out your offerings? Use the Recency report to see how many days in between visits. Using the thought process above, this report can also help determine success rates of your website. This report features both the Browsers & OS report and the Network reports. This is an ideal grouping of reports for your IT team, when considering website changes, such as: flash components, interactive video displays, font choices, and more. Specifically using the Browsers & OS report, we can see which browsers and operating systems bring you the most website traffic. For example, if your IT team has come across a great new website widget, but it's not fully compatible with the older versions of Internet Explorer, you could estimate how much of your website traffic would be missing out on this new feature. These reports show you how many website visitors are sharing your content through social media (eg. liking one of your pages from the Facebook acount, tweeting one of your latest stories, etc.). Please note: you do need to setup additional tracking code on your website to fully setup. See this link: http://code.google.com/apis/analytics/docs/tracking/gaTrackingSocial.html. Using the Engagement report, you can see a simply, yet effective, report of showing how many of your website visitors are "socially engaged" with your site. That basically means participating in one of the next activities. In the Action report, you will be able to see which social media platforms (Facebook, Twitter, Google+, etc.) your website visitors are using most to share your content. Use the Pages report to see which web pages of yours are the most popular for website visitors to share with their social connections. This report compares the number of your website visitors that are accessing your website via a desktop or laptop, compared to those accessing through a mobile device. Use Overview report to see the actual numbers in the form of a yes or no answer to the question; "Are website vistors using a mobile device?" This is a key report to understand. If you have a high number of mobile visitors, make sure your website is mobile-friendly and optimized for mobile use. In the Devices report, you can see various breakdowns of actual devices your website visitors are using to access your website. What do you notice about the differences between the two quarters with respect to visitor characteristics? Name a few areas in which you see a noticeable change. Select www.remotecourse.com web property to work on. From the report navigational panel select the Audience category which by default will display the Overview report. Using the active date range tab, first enable the Compare to Past option and then provide the following date ranges: From January 1st, 2009 to March 31st 2009 and From April 1st 2009 to June 30th 2009. A very high level observation is that we were able to attract fewer customers to our website during the second quarter of 2009. However, the visitors engagement with our website increased in the second quarter of 2009. Executives at your company would like to identify promising regional markets to expand the company's business activities. Choose the appropriate report and write down the geographic regions which are desirable for business expansion. From the report navigational panel select the Demographics category. Select the subcategory as Location. Note your observation about the countries which are sending the most traffic to your site. For this exercise, select United States as the country/territory. Note the different states within the USA which are sending a high volume of traffic. Use the Detail Level drop down menu and select the item City to identify particular cities from which you have received heavy traffic. Using the report visualization control panel, select the Pivot Table option. 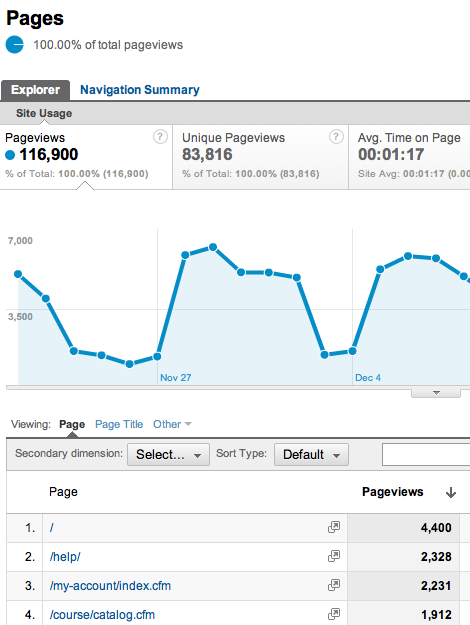 Use the drop down menu to add the Bounce Rate metric, which allows you to see the quality of the traffic. Use the date range to compare the data set with the previous month or previous quarter. This allows you to see the trend. Information obtained via reports can help you to make an informed decision for targeted market expansion. The marketing team at your company wants to know the distribution of new vs. returning visitors. They are particularly interested in seeing how these visitors got to your site. Create a report that provides this information. From the report navigational panel select the Behavior category. Select the subcategory as New vs. Returning. Use the sub-dimension drop down menu and select Medium as your dimension to see what channel each class of visitors used (e.g., New Visitors mostly use the organic medium to arrive to your website). The marketing team at your company wants to know if their latest lead-generation email campaign is bringing traffic back to the website. The team sends daily emails for a one-week period after a potetial client signs up. Create a report that provides this information. Select the subcategory as Frequency & Recency . Use the Days Since Last Visit report and determine if a majority of your traffic was between 0-1 days since their last visit. The marketing team at your company wants to add in a new interactive video player. They've realized that anyone using Internet Explorer 6 or later, will not be able to view this new player. Create a report that provides the information on how many website visitors would not be able to view this player. Select the subcategory as Technology. Choose the Browsers & OS Report. Click on the Internet Explorer listing. 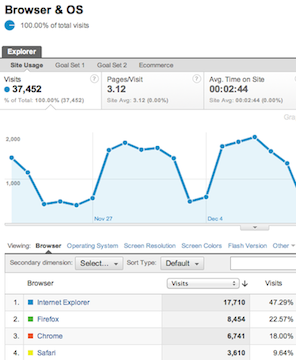 Once you've drilled down the data, determine how many visitors in any given month have IE 6 or earlier. The marketing team at your company is thinking about developing a mobile version of your website. They want to know how many visitors currently use a mobile device. As a secondary request, the team wants to test out a mobile phone app, but only have the resources to develop one initial version. Should they develop an Android-based app or an iOS app? Create a report that provides this information. Select the subcategory as Mobile. Use the Overview report to download the appropriate number of mobile users in a one-month time period. Now, use the Devices report, and click on Operating System above the search bar on the report. Determine what is more popular; iPhone and iPad users, or Android users. Share with the team. This category of reports provides you with information about the origin of your traffic. Where the traffic to your website is coming from. Which are your top referrals. Which keywords are bringing visitors to your website. This information could be leveraged for marketing and SEO purposes. The following screen shot represents the overview report which acts like a default home page from this category of reports. You will see that it represents a quick summary of important stats such as top traffic sources and top keywords which sent most of the traffic to your website. Total traffic classified by four main source categories: Direct, Search Engine, Referral, and Campaigns. By default, the top keywords arranged in descending order based on the number of visits they generated. 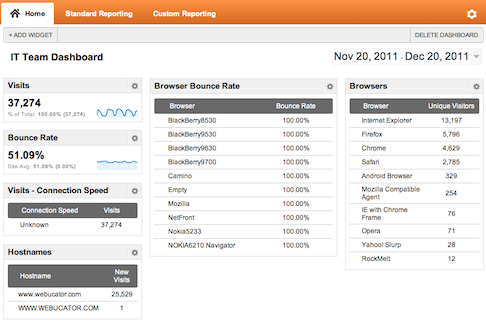 Note that you can also "quick-click" to a few other reports, such as: Source and Landing Pages. Direct Traffic refers to those visitors who come directly to your site either by typing your web address or by selecting your site from their favorites menu. The following screen shot shows a standard Direct Traffic report. The Search report is an excellent way to tell how well your organic ranking efforts are working and how effective your paid listings are. This group of report includes an Overview Report, and then reports to break down your organic traffic and paid traffic, repspectively. The following screen shot is an example of the Organic report, specifically looking at sources. In this example, you can see that Google is sending the most traffic to this website. The keywords traffic report is an excellent source for identifying brand association and evaluating the effectiveness of your search engine optimization efforts. 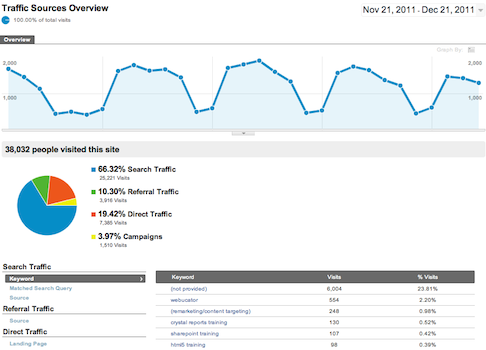 The following screen shot is an example of the Keywords report, found within the Organic report. You will notice that most of the traffic is from "not-provided." Unfortunately, Google has recently added in a new secure browsing feature. So, anyone logged into any Google propety (Gmail, YouTube, Blogger, etc.). Anyone who is not logged in, will still show their search terms. In the screen shot below, you'll notice "Webucator" is the most popular known keyword used. Let us assume that remotecourse.com is a startup company. Using the reports available in the Traffic sources category check whether their brand awareness increased over a period from Jan 2008 to Jan 2009. In addition to the above task, determine what types of visitors (new vs. returning) constitute the total amount of direct traffic. What does this information convey to you in context to checking brand awareness? From the report navigational panel select the Traffic Sources category. Select the subcategory as Direct Traffic. Select the appropriate date range to compare results. Using the drop down menu, select the dimension as Visitor Type. Use the Percentage view to see the graphical representation of data. The marketing department at your company has decided to start a paid online advertisement campaign. Using Google Analytics determine which search engine and website would be the most ideal for launching the online marketing campaign for your company's website. Using Google Analytics determine the preferred language for the online marketing campaign. Use the Traffic Sources reports to determine which keywords are driving the most traffic to your site. Select the All Traffic Sources report. Note the different types of sources (search engines and referral web sites) which are sending traffic to your website. Now, use the Dimension drop down menu and select the item Language. This will help in identifying the preferred language used by your visitors from the respective sources. For question #3 simply select the Keywords report to display the list of keywords along with the respective number of visits associated with them. Reports in this category enable you to find out how visitors use the content on your website and whether your content is well placed on your website. The reports in this section can also help in understanding the navigational behavior of visitors. Let's briefly look at the Overview Report. Note the section of special reports which enables you to dig deeper into analysis. Notice the ability to "quick-click" over to other content related reports from this view as well. Knowing which pages are popular on your site and how they are used is an obviously helpful metric. The Pages report provides this information. In the following screen shot you can see that the homepage of this website happens to be the top content page and receives the highest number of visits, followed by the help web page (where students login). Advanced in-line filters are very helpful in deciphering information available in this report. In the above screen shot you can see that different conditions can be applied on the available metrics and dimensions. The above conditions will display web pages which contain SQL in the URL structure, along with pageviews greater than or equal to 10 and the bounce rate less than 70%. This report shows the number of times visitors entered your page through a specific page and how often they bounced right back off. Landing Pages are the pages from where visitors started their journey on your website. 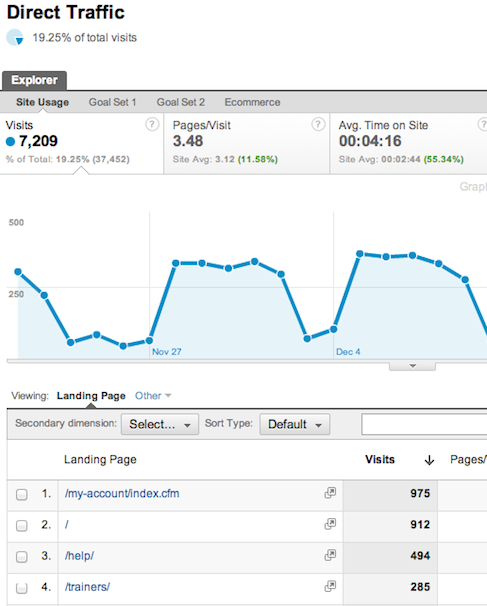 The following is an example of the Top Landing Pages report in Google Analytics. Notice that the graph is showing number of Entrances. This report helps you to understand from what pages visitors are leaving your site. In the following example, you can see that the homepage of this website also happens to be the top exit page. This report can be leveraged to analyze which pages are leaking traffic on your website. 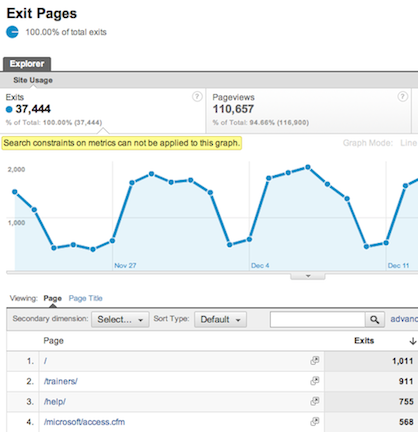 You should check top exit pages report to make sure that the gateway pages on your website do not have high exit rates. Google Analytics can also be used for understanding users' navigation patterns, though this feature is limited to individual pages only. 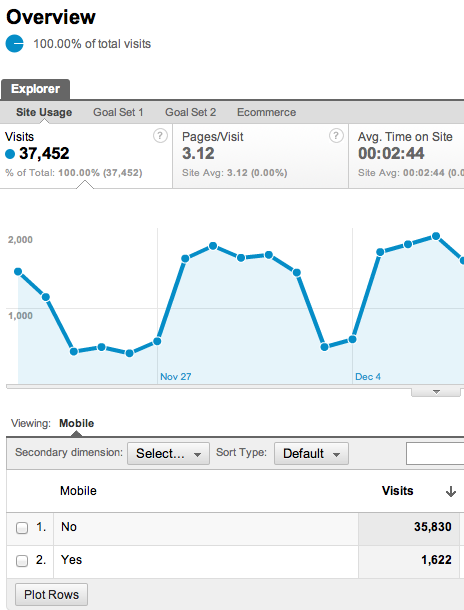 The following example shows how the In-Page Analytics report displays in Google Analytics. 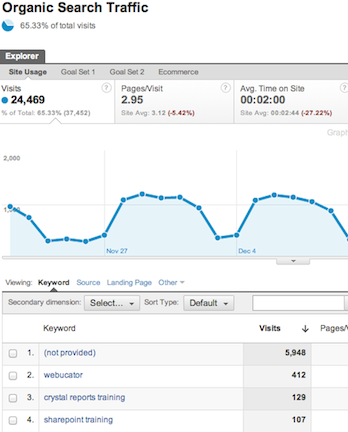 From the above report, you can see where visitors clicked on your website. You can also click through each page within your website, and then see where visitors clicked on those pages as well. This is a great report to see which content on each webpage is most popular for visitors. Use the advanced in-line filter to exclude all the pages with pageviews less than 500 and bounce rate higher than 90% and average time on page less than 30 seconds. The marketing team in your company would like to identify the most viewed product category on your site and the respective keywords used by the visitors to land on those pages. Provide the names of the top 5 web pages and the list of keywords associated with them. Select the Landing Pages report. Note the different types of page titles. Now, use the Dimension drop down menu and select the item Keyword. Select theExit Pages report. Note the pageviews column associated with each exit page. Now, use the in-line filter to exclude your goal pages. Please review the following report and share your interpretations with the class. 1) During the time period listed, there was a total of 117 pageviews. 2) Of the courses listed, Google Analytics was the most popular with 34% of total clicks. 3) 1% of clicks happened on the free online demo. 4) Less than 4% of clicks happened below the fold of this webpage. 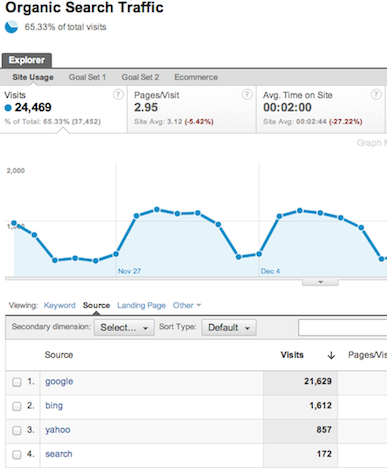 5) The overall bounce rate is right around 30%, which is very good for this website overall.